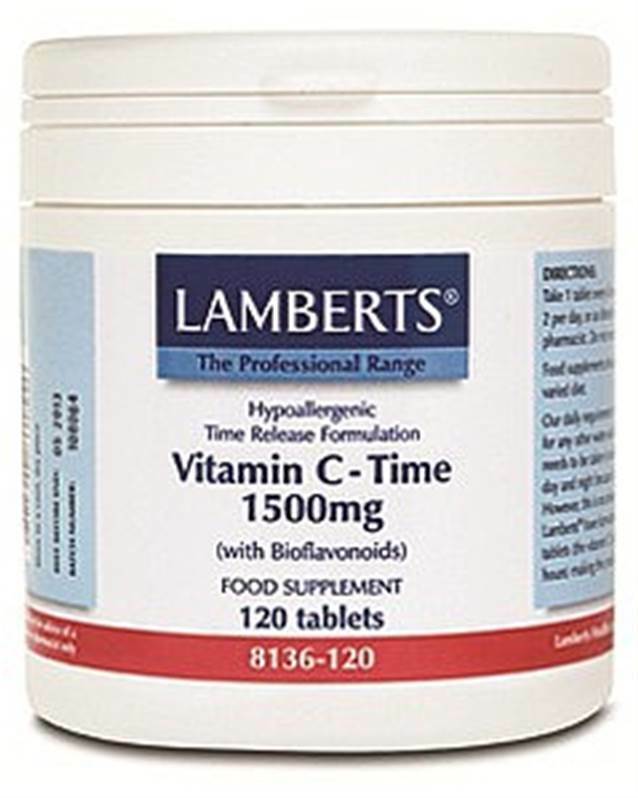 Lamberts Time Release Vitamin C 1500mg tablets also provide a relevant level of citrus bioflavonoids since studies show that vitamin C and bioflavonoids are most effective when taken together. Time release because viatamin C ideally needs to be taken in small doses throughout the day. Vitamin C is needed for a healthy immune system, healthy bones, teeth and gums as well as helping to maintain normal blood fat and cholesterol levels. Our daily requirement for vitamin C is higher than for any other water-soluble vitamin. Ideally, vitamin C needs to be taken in small amounts throughout the day and night because it is rapidly lost from the body. However, this is not always convenient which is why Lamberts® have formulated Time Release Vitamin C tablets. Lamberts® Time Release Vitamin C 1500mg tablets also contain a relevant level of bioflavonoids because they are known to aid vitamin C absorption. Bioflavonoids have also been demonstrated to have specific effects including a strengthening effect on the capillaries. Hydroxypropyl Methylcellulose DiCalcium Phosphate Stearic Acid Magnesium Stearate Tablet Coating (Hydroxypropyl Methylcellulose Glycerin) Silicon Dioxide. 1 tablet every 6 hours up to a maximum of 2 per day.